Particles are a nice feature of Blender. You can use them in any segment of animation. Blend files with particles are small because particles are of a procedural nature, but you need more computer power to preview the scene in real-time. You can give every family of particles a different material, make fireworks, use static particles for hair and plants and give them a shadow. I want to teach you how to command particles where to go. This unique Blender feature use the eighth texture channel to calculate the particles movement. I will divide this tutorial in two parts: in the first part I will tell you how to get "solid" particle movement, and in the second how to make particles go in the turbulence using texture. First of all you need a texture. Make it in any graphic program like Gimp or Photoshop. Let it be black texture with big white letter "B" in the middle. This picture will "tell" the particles to follow the shape of letter, which creates a very interesting effect. In the default scene apply a new material to the Plane and use this picture as texture (it's packed in the blend file). 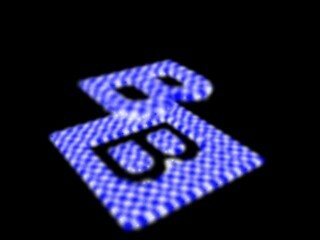 There is one important thing: you must use this picture in the eighth texture channel (the right most channel in the MaterialButtons ), because this is the only channel that can give this effect. Because of this the eighth texture channel will not be used for texturing particles, but of course you can still use the other channels to texture the particles. Do a few subdivides on the plane to get more emitters so you can get a more accurate picture of the shape you create. Go to the animation menu and select particles. Make number of particles to 5000, and set the particle life to 250 so you can enjoy the effect much longer. Now you need to tell the particle system to follow the shape of the texture. And now the hard question is: "How to do that?". The answer is very simple: you need to put the right parameters in the particle system. The most important is lower edge of particle menu. This is where you can find options you need. There are three options you need to modify: the first option to set is "TEX". This options tells Blender how much the texture influences the particle movement. A value of 2 is the highest level of texture influence. You also need to set Damp to 1, so that all particles will be together all their life and all particles will start and finish their life in the same place. The second value you can set is "texture: Z". By default this value is set to 1 in which case the particles will go up. Set it to -1 and the particles will fall down. With this you can make particle field with the accurate shape of the texture. Use black/white 2-bit images because they give better resolution. Every color texture will be converted to grayscale (internally) so shape will not be perfect. Download the animation here. Now we go to the second part of tutorial : dancing particles. Every procedural texture plug in (clouds, marble, wood...) can be used to give turbulence to particles. That way the particles are very "alive". Because it is winter I will introduce way to make a scene with beautiful falling snow. Lets begin. For the background use picture of landscape(packed in blend file). Now we need to make our "snow emitter". 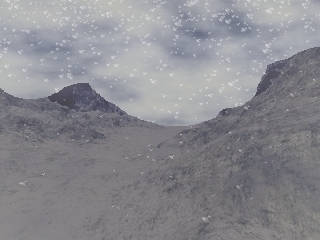 Snow emitter will be mesh plane subdivide to 120 vertices. For the eighth texture channel use some turbulent procedural texture or a texture plug in. Usually I use clouds, or marble, but for this tutorial I used the clouds2 plug in. Wood also is good if you give it an amount of turbulence. What is left is to set values in the particle menu. Download the blend file here. Our snow emitter have 10000 particles. For the first and last frame we use value:1 to 250.Life is set to 86. Keys are very important when we must have fluid particle movement, so set Keys to 32. Set random life to 0.5. Because we use a texture to determine the particle movement set Tex to 2. As I mentioned before this value makes the particles "listen" to the texture. Damp is set to 0.15. This is how we control particles . With this value particles will not spread too much. Set Force: Z to -0.09. This will make the particles fall down. A very important thing is setting Blenders animation system. You have the option to choose between: Int ,RGB and Grad. Int is default settings for particle systems. In option RGB Blender calculate speed and movement of particles according color of texture. Red is for x component of speed, Green for Y and Blue for Z component. In this tutorial we use last option: Grad. "Grad" means the gradient of the texture. With help of mathematics Blender calculates the speed vector from the texture. Composed with high a high keys value this gives beautiful twisting effect. But be careful, you must make many adjustments to find the "right" value for nice twisting! Nabla is set to 0.014. Nabla button select dimension of texture area where the gradient is calculated.All you need is to apply some material to particles (snow texture) and animate it!